Send this stunning bouquet of fresh orchid with lovely white rose in nice packing to your loved once. A bunch of 6 Orchid and 12 white roses in nice paper packing. SKU: 62. 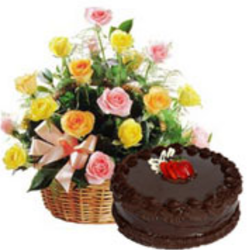 Categories: Buy online Diwali Gifts, Combo Offers, Dry Fruits, Gifts, hampers, Roses, Sweets. Tags: diwali dry fruits delivery in Gurgaon, flowers delivery in gurgaon, Rasgulla delivery in Gurgaon, Send diwali sweets to gurgaon, sweets delivery in Gurgaon. Our company has been successful in winning appreciation from the clients as one of the most prominent names in the trading of Tulips Flowers. lilies are strong form flowers with equally strong lines, so even few stems in a vase or bouquet make a dramatic statement.